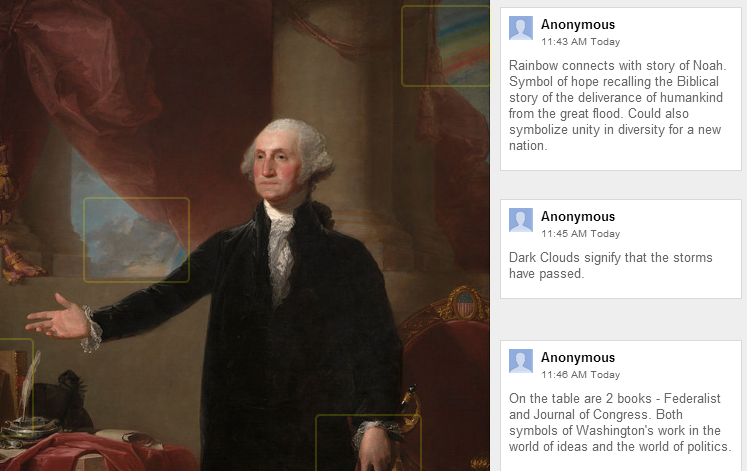 Google Drive makes it possible for teachers to upload images to the web for students in the class to comment on and critique. This would be a great way to get students thinking about certain concepts at the start of a unit and could be used as an anticipatory set. Art teachers may want to have their students upload their class work in order for their classmates to provide them with peer feedback. I uploaded this portrait of George Washington to a public folder in Google Drive and shared it with the setting - anyone with the link can comment. I recommend that when you share the photo that you share it with anyone in HCPS can comment. That way students will need to log into their Drive accounts prior to posting a comment. This will attach their name to the comment rather than the name "Anonymous".